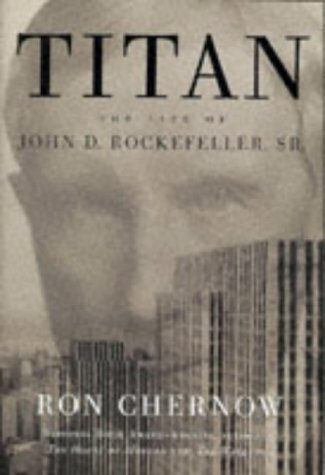 Titan : the life of John D. Rockefeller Sr.
London : Little, Brown, 1998. A biography of America's first billionaire, John D. Rockefeller, Sr., drawing from Rockefeller's personal papers to provide information about his rustic origins, his creation of Standard Oil, his often controversial business tactics, and his personal relationships and attributes. This is the long life of Rockefeller. He got into the oil business in 1865, and by the early 1880s - a mere 15 years or so later - he owned 90% of the industry. The book rightly focuses on this early period. It also focuses on 1905-1911 when he retired and was the subject of the Ida Tarbell muck racking, and family dramas. These are the two most interesting parts because they were the great storms of his life - professional and personal - through which he steered a passage and transformation. Rockefeller has a single-minded drive to make money, which lasts until the 1920s when he starts to loosen up and become more human suggesting an inner character development. In the 1870s, his upright religious persona bolstered his credibility with bankers allowing him to raise cash to consolidate the industry rapidly; at the same time he was gaming the system to his advantage. Put kindly, the mark of a great man is the ability to hold contradicting ideas at the same time. Not so kindly, he was more greedy and hypocritical then the rest.